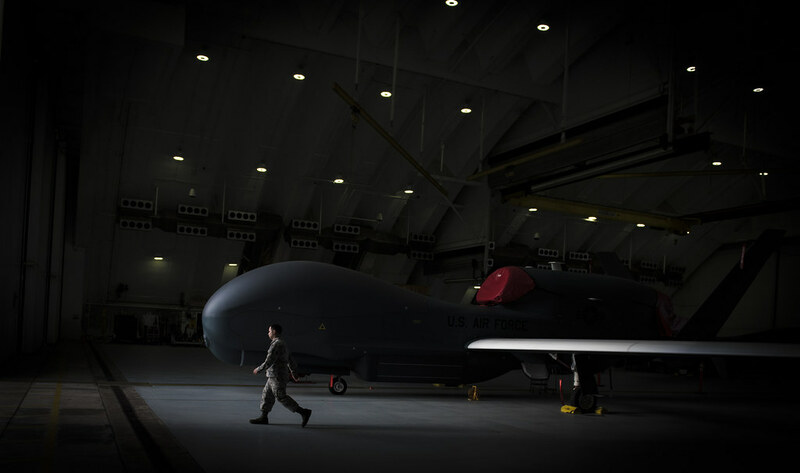 Intelligence, Surveillance, and Reconnaissance is the number one most requested capability by combat commanders and for more than a year enlisted Airmen have been helping the Air Force meet this demand by piloting the RQ-4 Global Hawk. 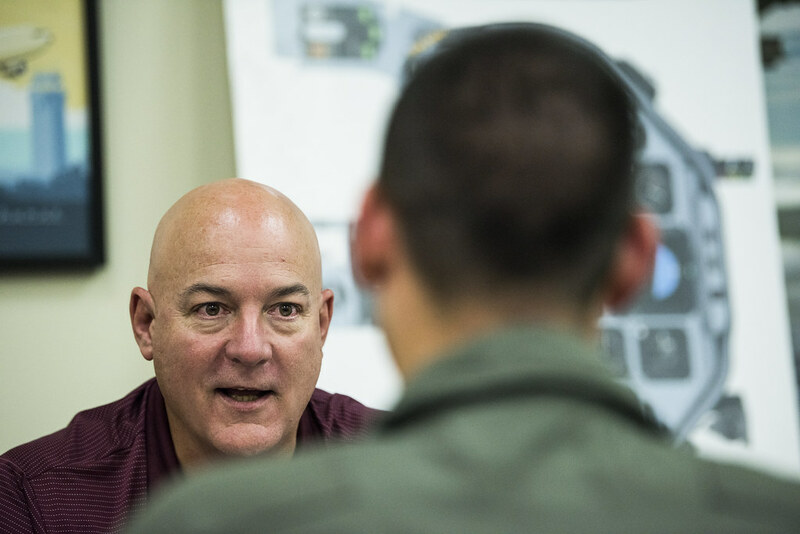 Air Force Chief of Staff Gen. Dave Goldfein has continually expressed the importance of the ISR force and finding innovative methods to relieve the pressure of getting commanders on the ground more data. A RQ-4 Global Hawk taxis for take off from the Beale Air Force Base, Calif. June 14, 2018. 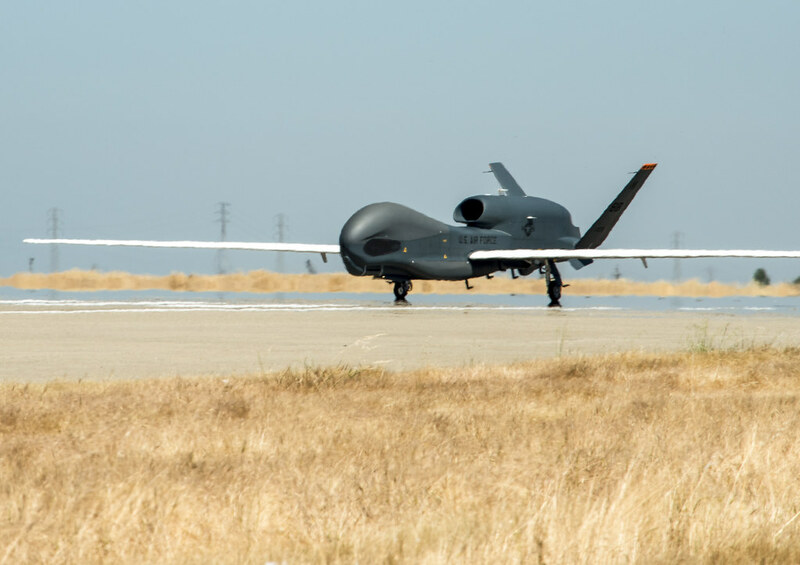 Last year enlisted pilots began to operate the unarmed RQ-4 Global Hawk, which conducts high-altitude reconnaissance missions up to 60,000 feet. 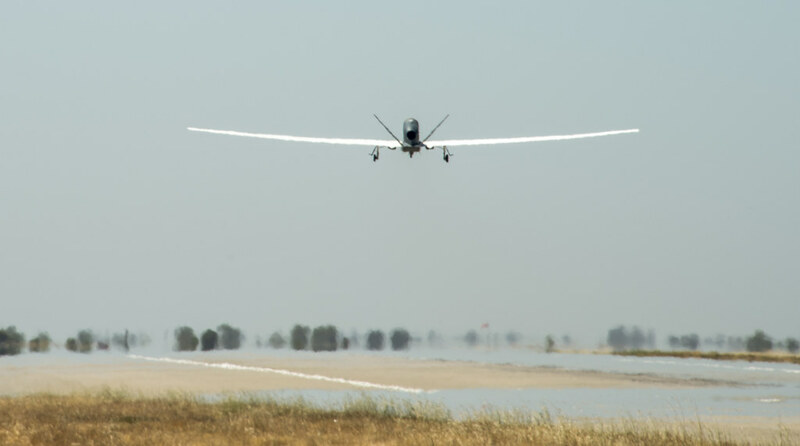 This marks the first time since World War II that enlisted Airmen will pilot aircraft, posturing our force to meet dynamic mission requirements as the intelligence, surveillance and reconnaissance mission grows. 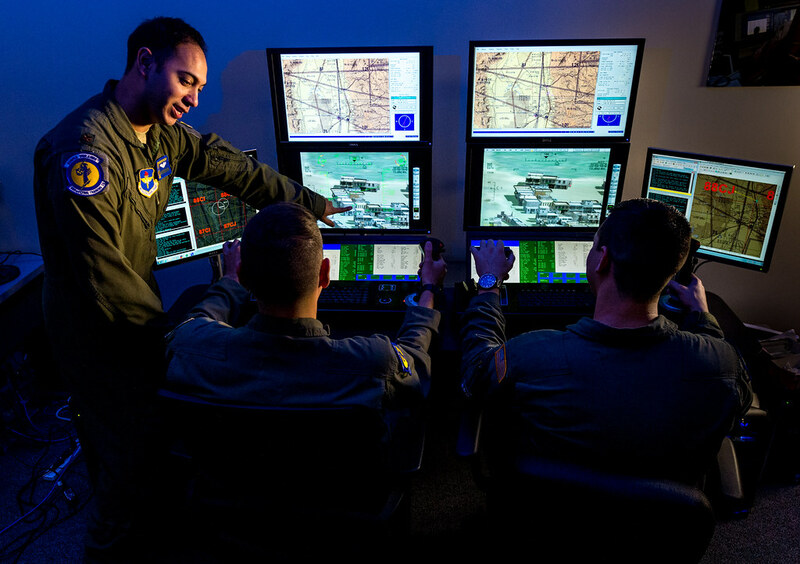 Integrating enlisted pilots into the RQ-4 community enables the Air Force to meet mission requirements as the intelligence, surveillance and reconnaissance mission grows, while providing an opportunity to our highly skilled enlisted force. In light of this, the Air Force selected 12 active-duty Airmen last year to become RQ-4 pilots as part of the first Enlisted Pilot Initial Class, the first enlisted Airmen to fly aircraft since 1942. Courtney has been part of the ISR career field throughout her career. 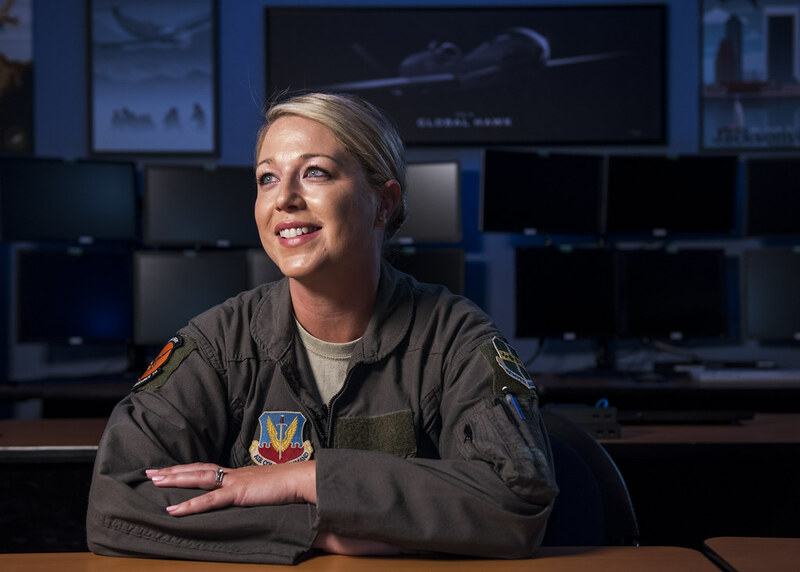 Over the years she’s filled several roles, including one as an imagery analyst and sensor operator for the MQ-1 Predator and the RQ-4, where she sat next to the pilot operating the aircraft’s camera during missions. 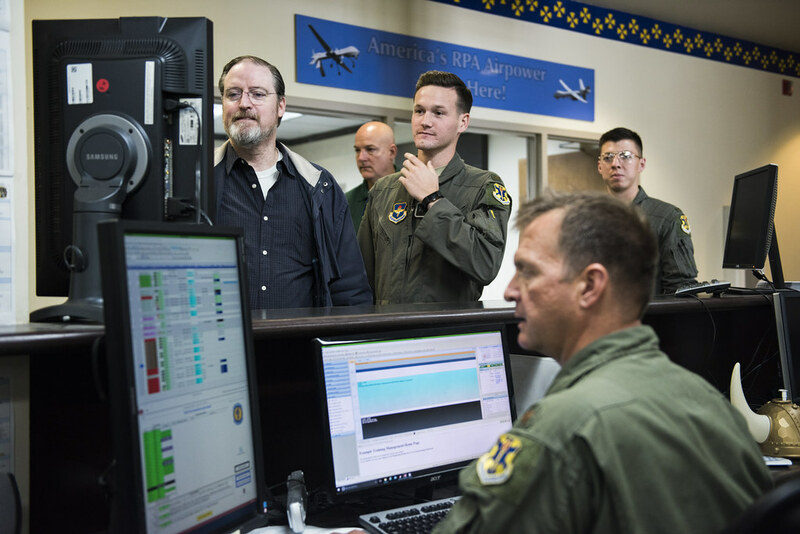 Enlisted pilots of the RQ-4 Global Hawk at Beale Air Force Base, Cali., are now flying operational missions after completing pilot training. 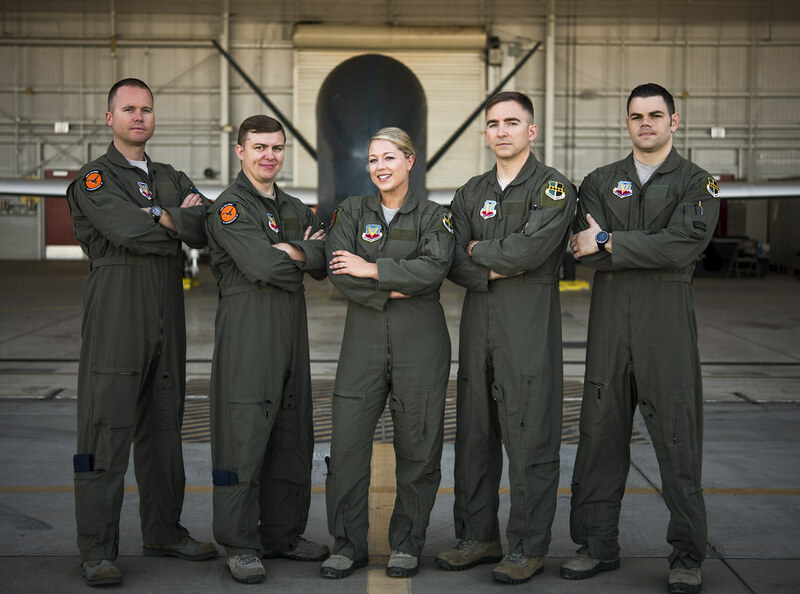 These are the first enlisted Airmen to fly aircraft for the U.S. Air Force since 1942. She always wanted to be a pilot and was going through the process of applying for Officer Training School to come back and fly RPAs when this program was offered as an exclusive volunteer possibility by the Air Force. Courtney says even though it’s unique paradigm shift to have officer and enlisted pilots training and flying side-by-side, the dynamic of operating and conducting a mission is no different than on any other airframe. For RQ-4 pilots, there are a lot of missions. Last year, the Air Force was tasked with nearly 25,000 ISR missions, collecting 340,000 hours of full motion video and producing 2.55 million intelligence products – which averages almost five products per minute that close intelligence gaps and support target analysis and development. 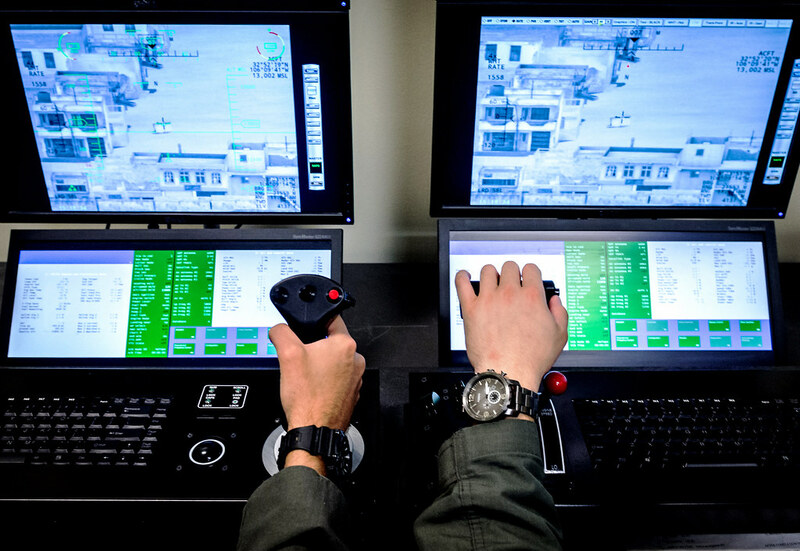 The Enlisted Pilot Initial Class training was created to provide more pilots to the RQ-4 program and ensure the Air Force is able to keep up with the high demand for its ISR products. But, training new pilots takes time as the RPA training program spans almost a full year. 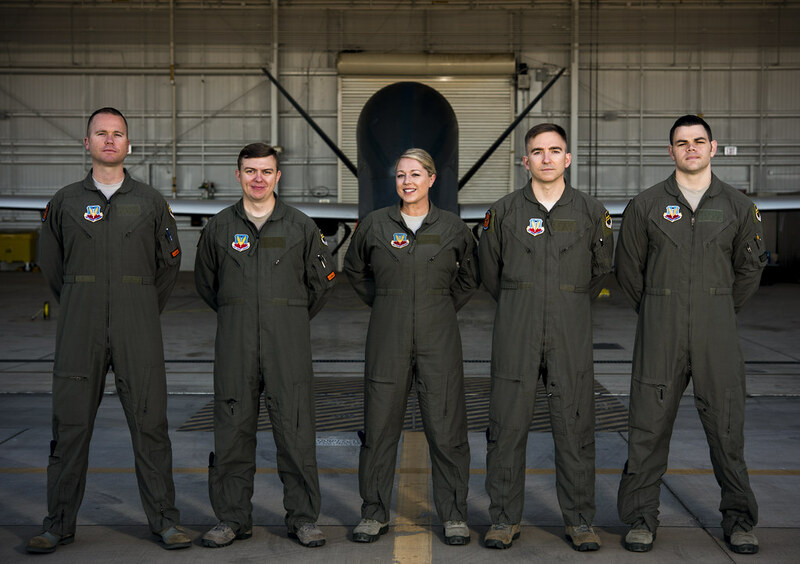 Airmen begin Initial Flight Training at Pueblo Memorial Airport in Pueblo, Colorado, where they learn to fly and complete a solo flight in a DA-20 Katana aircraft. 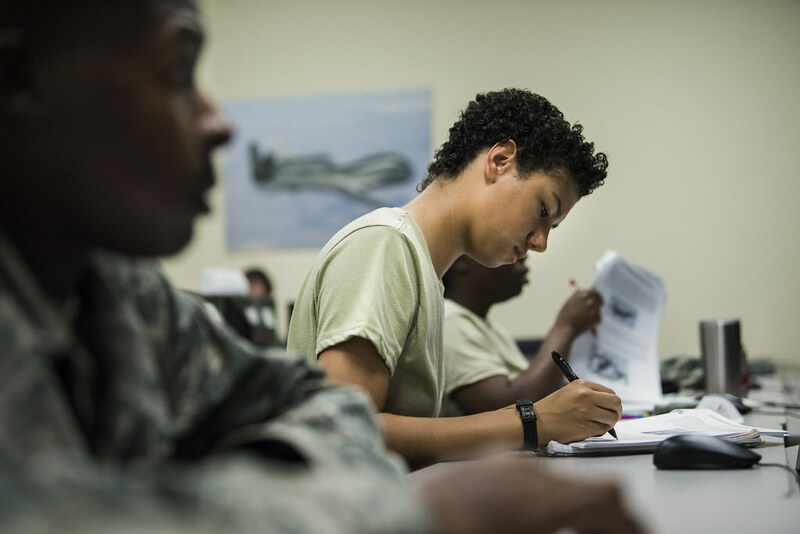 After IFT, students progress through the RPA Instrument Qualification Course and RPA Fundamentals Course at Joint Base San Antonio-Randolph, Texas, and then Global Hawk Basic Qualification Training at Beale Air Force Base, California. 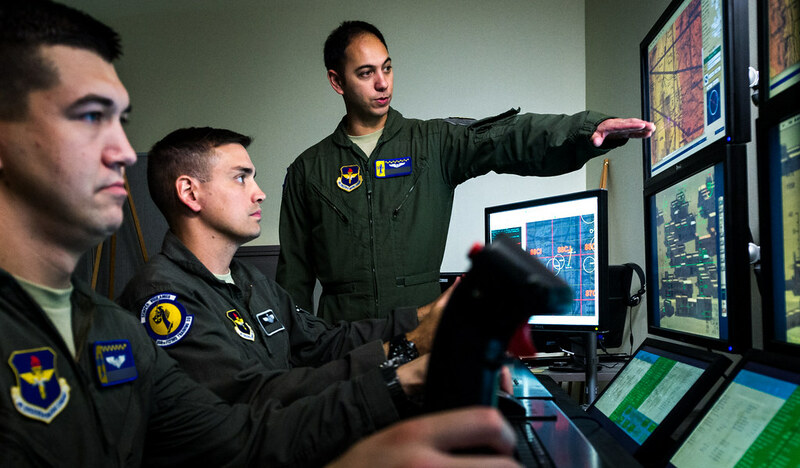 Maj. Michael, a remotely piloted aircraft fundamentals course instructor pilot, right, discusses a training mission utilizing the Predator Reaper Integrated Mission Environment simulator with Tech. Sgt. 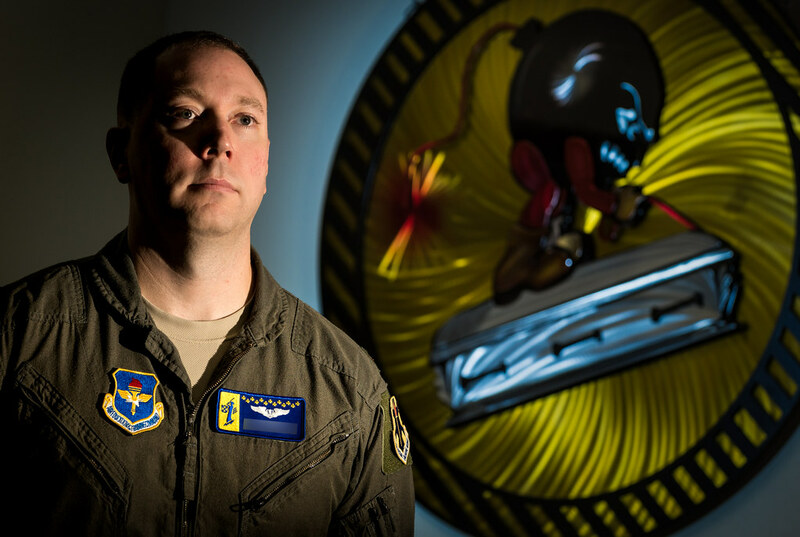 Ben, an enlisted pilot student, and Staff Sgt. James, a basic sensor operator course instructor at the 558th Flying Training Squadron at Joint Base San Antonio, Texas Jul. 17, 2018. 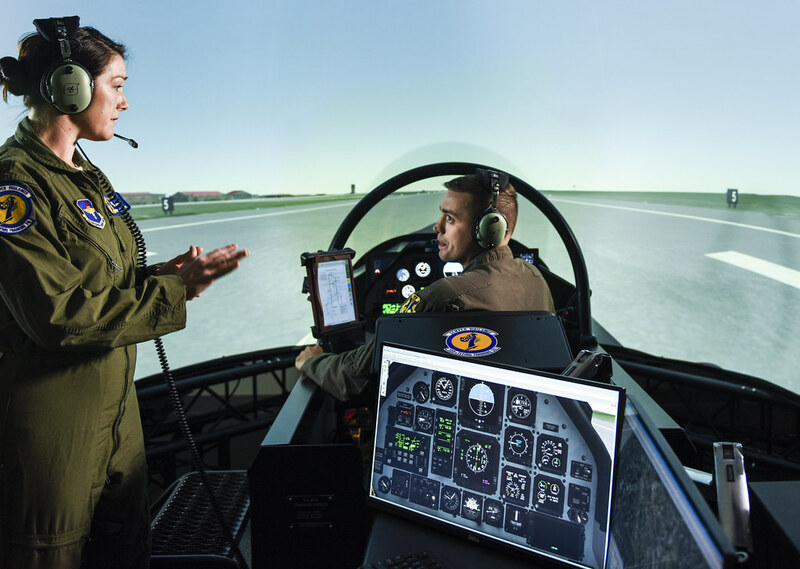 Both officer and enlisted RPA student pilots spend 85 days in the RPA Instrument Qualification course (RIQ) and 30 days in the RPA Fundamentals Course (RFC) at the 558th FTS, during the second phase of the Air Education and Training Command's RPA pilot curriculum. Last Names removed and obscured for OPSEC. 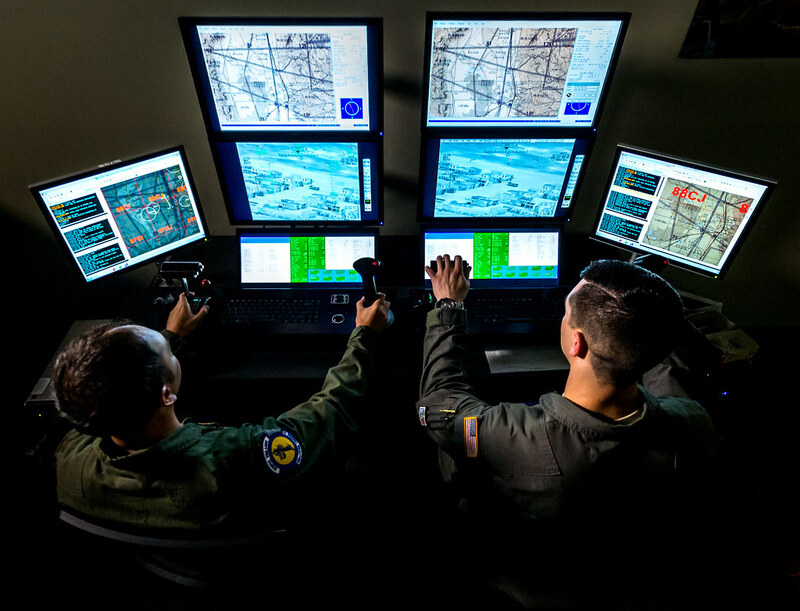 At the conclusion of this training Airmen are rated, instrument-qualified pilots who are Federal Aviation Administration certified to fly the RQ-4 in national and international airspace and mission-qualified to execute the high altitude ISR mission. Pannabecker, who is a retired Air Force colonel who helped with the inception of the RPA enterprise, thinks the Air Force is on track with a smart solution to a real problem, which is a shortage of pilots around the whole Air Force. 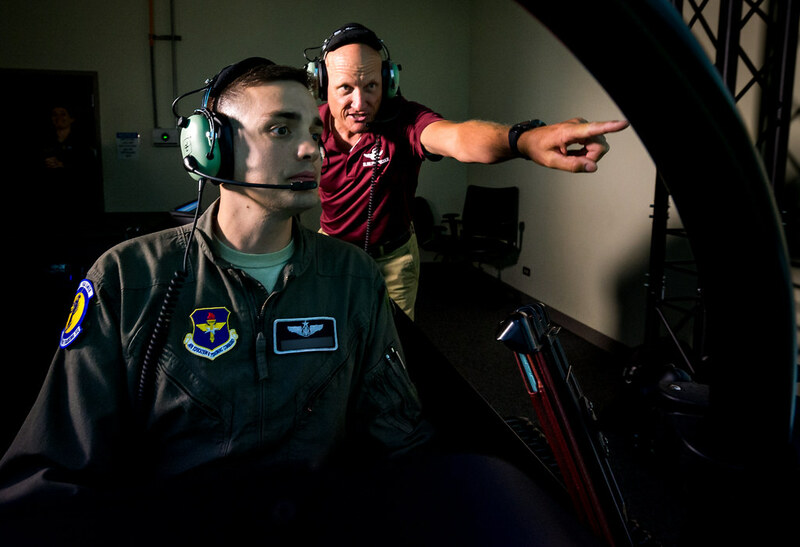 Keith Pannabecker, a remotely piloted aircraft qualification instructor pilot, left, monitors a training mission utilizing the T-6 Flight Simulator with Tech. Sgt. Ben, an enlisted RPA pilot student, at the 558th Flying Training Squadron at Joint Base San Antonio, Texas Jul. 17, 2018. Both officer and enlisted RPA student pilots spend 85 days in the RPA Instrument Qualification course (RIQ) and 30 days in the RPA Fundamentals Course (RFC) at the 558th FTS, during the second phase of the Air Education and Training Command’s RPA pilot curriculum. Last names removed and obscured for OPSEC. Remotely piloted aircraft qualification instructor pilots and student pilots review the training mission schedules of the the T-6 Flight Simulator at the 558th Flying Training Squadron at Joint Base San Antonio, Texas Jul. 17, 2018. 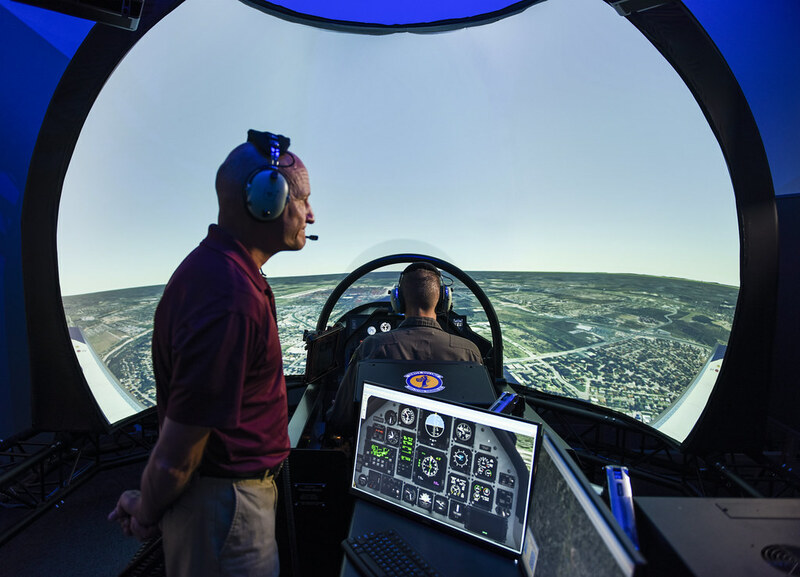 Both officer and enlisted RPA student pilots spend 85 days in the RPA Instrument Qualification course (RIQ) and 30 days in the RPA Fundamentals Course (RFC) at the 558th FTS, during the second phase of the Air Education and Training Command’s RPA pilot curriculum. Last names removed and obscured for OPSEC. Courtney said during February 2018 all RQ-4 missions in the 12th Reconnaissance Squadron at Beale were flown by enlisted pilots. 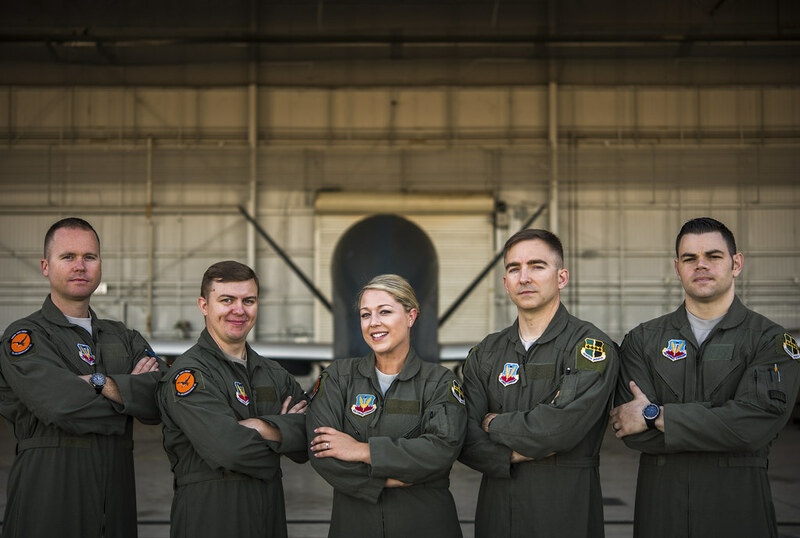 “I’m hopeful in the future for the enlisted pilots and an equal playing field, so we won’t be seen as enlisted or officer, but we’ll be seen simply as pilots,” said Courtney. Courtney believes the only thing that matters is providing intelligence that’s vital to the men and women on the ground fighting every day. An RQ-4 Global Hawk on Andersen Air Force Base, Guam. The RQ-4 is a high-altitude, long-range, unmanned and remotely piloted aircraft dedicated to the ISR mission.  Archived in Operational, RQ-4, Training and tagged Air Force, airman magazine, ISR, pilots, rpa, training. Bookmark the permalink.